Geneva, Switzerland – First released in 1968, and one year later throughout Europe, the legendary Toyota Hilux has been a dominant presence in the global pick-up market for nearly 50 years. 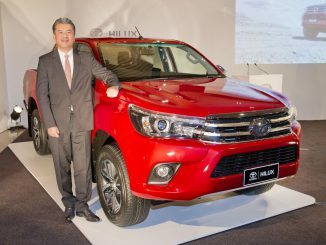 Available in Single Cab, four-seat Extra Cab and five-seat Double Cab body styles, the new, 8th generation Hilux builds on this legendary reputation and invincible QDR, redefining toughness for business users with a new and stronger ladder chassis, a reinforced deck structure, enhanced 4×4 capabilities, and an improved towing capacity. With the ‘Hilux’ signature integrated within the side of the casing, the new headlamp clusters wrap around the vehicle side fenders to further emphasise the width of the new pick-up. The advanced technology of the Keen Look headlamp design also incorporates powerful LED low-beam projectors, available on High grade models. 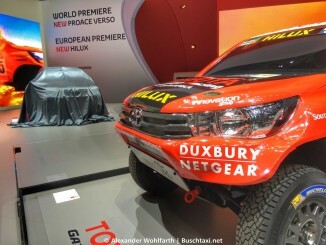 Below, the bumper design emphasises the tough, durable functionality expected of any Hilux. The trapezoidal shape of the lower grille highlights Toyota’s Under Priority design language, whilst the placement of the foglamp housings at the bumper extremities reinforces the new pick-up’s solid, stable front stance. Greater style is added to the design through the adoption of a blacked-out B pillar within the smooth, rear-slanted silhouette of Extra Cab and Double Cab model cabins, and a choice of new 17” and 18” alloy wheels. On Double Cab models, the linking of the cab and rear deck with a chrome beltline further unifies the overall design. The cab roof has been carefully shaped to improve both its styling and practicality. It now features an aerodynamic, ‘pagoda’-style ‘V’ shape that helps channel air over the roof and off the sides of the vehicle, rather than into the deck where it can create drag against the tailgate. Even the minor detail of the antenna has been considered; it has been repositioned further forward to keep it clear of bulky loads or deck attachments. Featuring a bold, horizontal spoke design to harmonise with the dashboard styling, a new steering wheel incorporates reach and rake adjustability, thumb rests, and a thicker, stitched rim to guarantee a comfortable grip for all drivers. 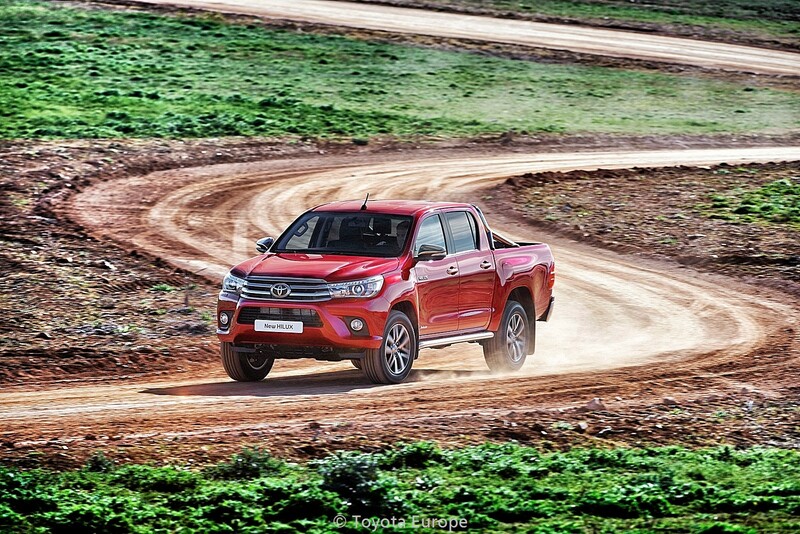 Two-wheel drive Hilux versions are mated to 6-speed manual transmissions, whilst all-wheel drive models offer a choice of 6-speed manual or 6-speed automatic gearboxes. Both transmissions have been extensively revised to improve durability, enhance low-speed driving performance and offer drivers quieter, smoother gear changes whilst realising the full potential of the new engine. All versions achieve a top speed of 170 km/h and accelerate from 0 to 100 km/h in 12.8 (6A/T) or 13.2 (6M/T) seconds. The tough, durable leaf spring and twin shock absorber rear suspension system has been extensively revised to combine the off-road articulation capabilities expected of a rugged all-wheel drive workhorse with SUV-like ride comfort and handling stability. Awarding it outstanding all-terrain capabilities, the all-new Hilux is equipped with a switchable all-wheel drive system featuring a high- and low-ratio transfer case, and both front and locking limited-slip rear differentials. 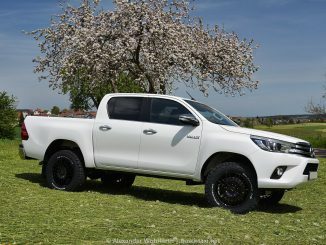 Acting in combination, the vastly improved low and medium speed torque delivery of Toyota’s newly developed 2.4 D-4D Global Diesel engine and the increased strength of the new, ladder-frame chassis have raised the towing capacity of the all-new Hilux to 3.2 tonnes. The new Hilux takes active safety and driver assistance to new levels with the availability of Toyota Safety Sense. Processing information provided by a compact, windscreen head-mounted unit housing both a laser and a camera, Toyota Safety Sense offers customers a Pre-Collision System (PCS), Lane Departure Alert (LDA), Automatic High Beam (AHB) and Road Sign Assist (RSA) systems.